I really love protecting the wildlife because I feel the National Parks are strong at protecting wildlife and ecosystems — especially because there are people like me who still really care about the outdoors. I feel there needs to be more support for protecting the outdoors in the United States and the national park system seems to be one organization that helps creates change and sustain it. In my job as a forestry intern I have seen that the culture of the park is to protect and preserve the natural habitat so that everyone can enjoy it. The people with whom I have worked all share the same goal of protecting the environment. I see the culture here as one that allows people to express who they are and allows everyone’s opinions to surface. The park professionals I work alongside are all about safety in the park. My overall goal for this internship is to create plenty of connections with park employees and learn more about what I am really passionate about — a place that I can come back to and work and to learn how to make changes that are impactful. I want to learn what I can do to really help slow or stop climate change. I also want to help stop the explosion of Spruce bark beetles. The beetles die off in the cold, but it hasn’t been cold enough to kill them all, which has resulted in such a large outbreak since 1996. I wasn’t aware that chain of command was such a big deal in the National Park Service. But I can understand that as a result, supervisors don’t have to deal with petty things and can really focus on their job. It also allows for my direct supervisors to get more leadership experience. This is also something that might be hard for me because at Eagle Rock School, my advisor is the head of school so I take my problems to him. And since I don’t really know Rocky’s superintendent, I would have no inclination to tell her something. Before my internship is completed, I plan to learn more about firefighting and how it might impact my life. My goal for this internship is to become an integral part of my team. I have always loved firefighting and want to be a seasonal firefighter in the summers. I’d like to get some federal certifications through the job. I am also hoping to be able to make some money that I can use after I graduate from Eagle Rock School. I hope to create more opportunities for myself in life and create long-lasting friendships through this whole experience! Each Tuesday and Thursday I trade in my shorts and T-shirt for a Rocky Mountain National Park VIP uniform. On these days, I spend eight or nine hours as a part of the Park’s Interpretation Division Team. On Tuesdays, I spend my time at a spot in the park called Hidden Valley, which is the headquarters for the Junior Ranger Program. During the day, I participate in and facilitate a number of different tasks, ranging from standing outside the ranger station answering guest’s questions, to swearing in our newest set of excited Junior Rangers. And man, when I say these kids are excited, I mean it. It brings me joy knowing that some of these kids are the future of the National Park Service workforce and support system. On Thursdays, I am assigned front desk duty at Beaver Meadows Visitor Center, which is the busiest visitor center in Rocky Mountain National Park. During my shift, I work around the front desk performing an array of different tasks. Among these tasks are answering questions, giving directions and offering suggestions to inquisitive visitors. Associated with the Park’s mission statement is a set of five integral core values. These values are shared stewardship, excellence, integrity, tradition and respect. As an intern assigned with interpretive staff member responsibilities, one of these values — excellence — really resonates with me and is essential to my area of service. 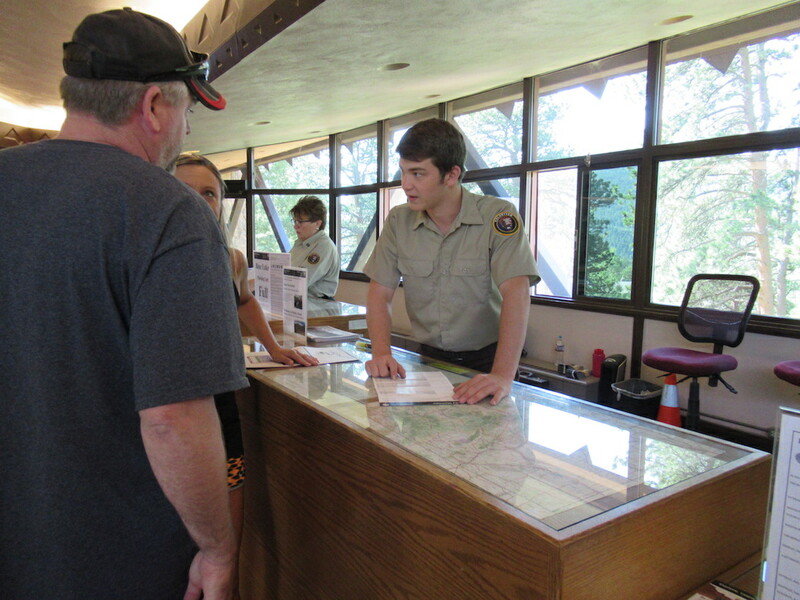 I say this because when I’m on the job, I am constantly striving to learn more about the park and broaden my knowledge base so that I can better assist and help park visitors. This is a perfect example of Rocky’s organizational culture, which is simple and welcoming for interns like me to understand and adopt. When on the job, it’s really easy to go with the flow of the culture. Respect the visitors, work as a team, and act with professionalism. During the last weeks of my internship, I would like to accomplish a couple objectives I set for myself in Week One of my internship. These are to become more familiar with Rocky’s park map and learn more about the park’s Natural Resource Management division. For my first objective, I can confidently say I am doing well with learning the map. Working at the front desk where the park map is in front of me all day sure helps. As for the second objective, I need to talk with someone in the Natural Resource Management division. I can see myself pursuing a position in that division as a possible career path. As an intern in Rocky Mountain National Park, I head up to Moraine Park on Tuesdays to participate in Discovery Days. That’s when we help set up a number of tables with different activities that highlight the park’s geology. 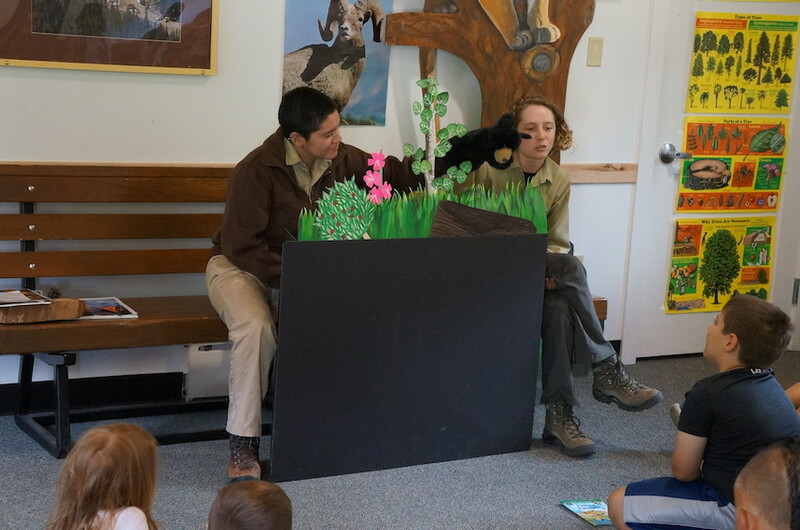 We help families with questions about the activity and swear in Junior Rangers, which is a program for kids who learn how to protect the park ecosystems and wildlife. On Thursdays, I work in a Junior Ranger program in Hidden Valley. On those days, we do four 30-minute programs on fire ecology. There are national park fire fighters who come for two of the programs and there is a fire demonstration to show how different types of forests burn. One of the core values from the park system to which I connect the most is respect. This particular core value is about embracing everyone’s differences. For example, we all embrace the diversity in the employees and visitors. I connect with this value because I grew up surrounded by a very diverse community. One of my objectives for this class is to facilitate at least one of the 30-minute Junior Ranger programs with which I participate on Thursdays. One of my other objectives is to learn about the different ecosystems I am working in. I want to be able to answer visitor questions on what kinds of flowers and wildlife live in the park. One thing I realize is that organizational culture at Eagle Rock School and within the park are worlds apart. At Eagle Rock, people are very forgiving and more lenient. Being in the park you can’t really be that way. You have to get things done and if it doesn’t get done it affects everyone. As my internship starts to come to an end, I am going to work in the greenhouse for the park’s Resources division and I’m really looking forward to working with a new crew and being out in nature. 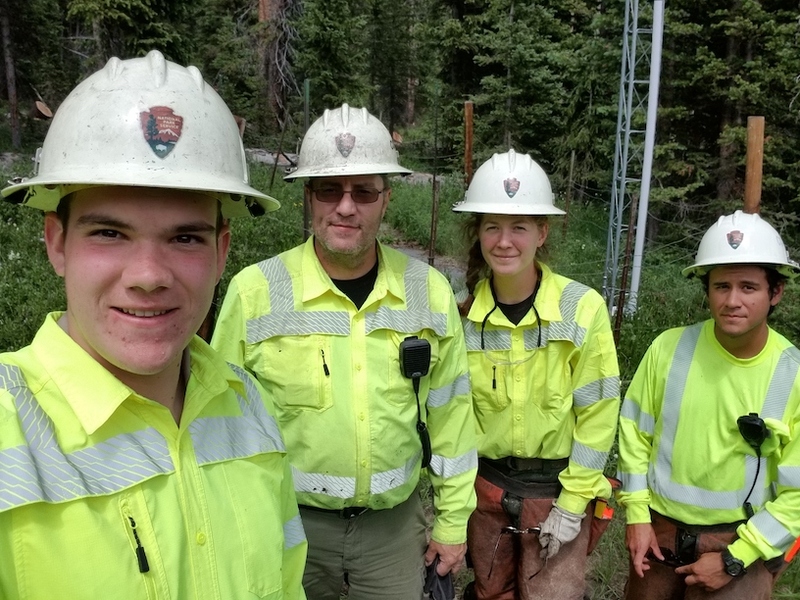 This entry was posted in Meet The Student and tagged Hidden Valley, Internships, Ixtel Nava-Barron, Jon Anderson, Moraine Park, RMNP Discovery Days, RMNP Junior Ranger Program, Rocky Mountain National Park, Service Learning, Soren Arvidson, Spencer Lanier.